All gemstones displayed are unique; it is possible to order a single unit or a pair as per item description. Please send us your request, if you look for gemstones with similar features. We guarantee that all our gemstones are natural. Every gemstone is analysed by our gemmologists before being put on sale. 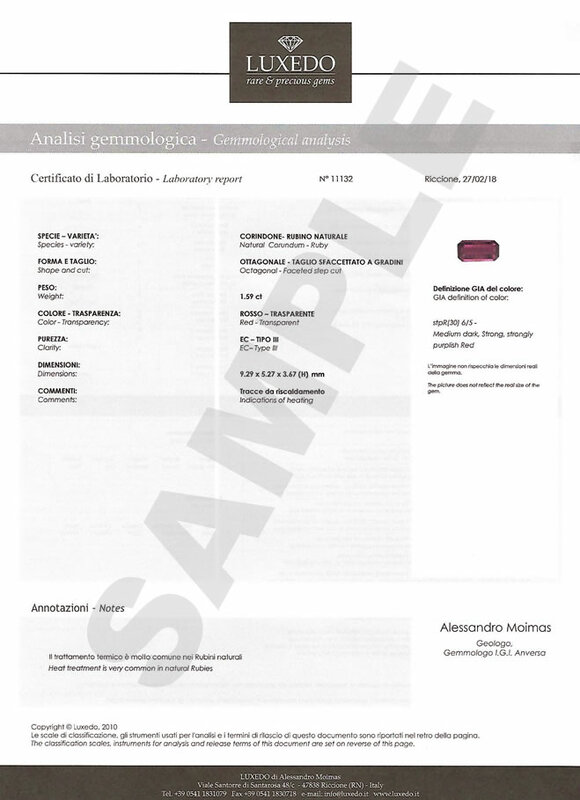 The issue of the gemmological certificate, i.e. 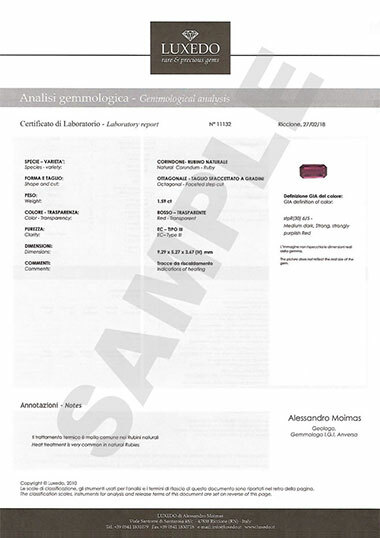 the document signed by our laboratory manager with all the physical features of the gemstone, is optional where not included in the price. 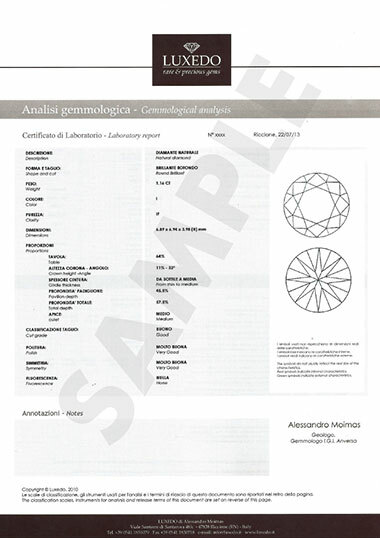 Our certificates comply with UNI directives on gemmological analysis. Our expert gemmologists personally evaluate important parameters such as colour, clarity and brilliance of the gemstone. They grade every gemstone from 1 to 10, as shown in the detailed gemstone description with the corresponding number of green stars, so to help you understand the quality of a gemstone. Gemstones sizes are expressed in millimetres up to one hundredth of a millimetre. Real sizes of gemstones and jewels can be easily deducted comparing the sizes shown in the detailed product description to the dimensions of a coin or using squared paper or a millimetre ruler. Gemstones of same carat weight can have different sizes due to their specific weight, shape and cut. Natural gemstones often have crystal inclusions, cleavage, feathers, cavities, etc. All these flaws are usually classified under the generic term of “inclusions”. Internal inclusions are analysed in order to establish the clarity of a gemstone. Diamonds clarity grading of is different from coloured gemstones one. DIAMOND: International regulations on diamond clarity require inclusions to be identified using an achromatic aplanatic 10x loupe. 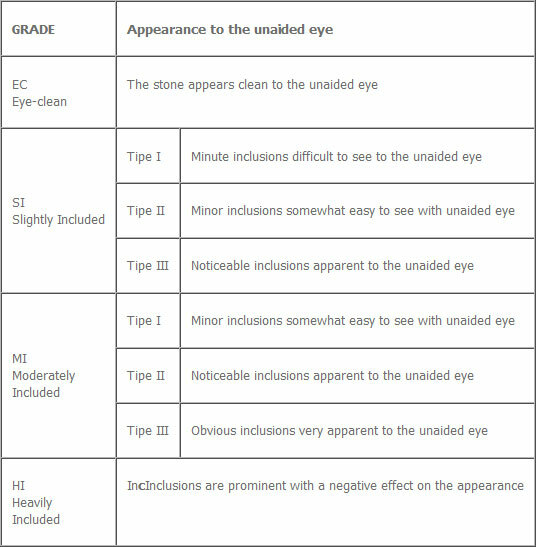 Definition of clarity grading according to international standards. 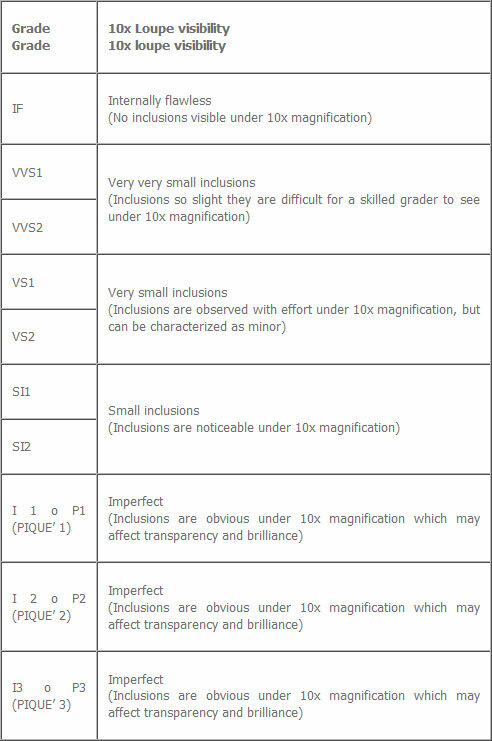 Gemstones under 0.30 ct are not required to be classified into sub-groups 1 and 2 for clarity grades VVS, VS and SI. COLOURED GEMSTONES: gemstone clarity is evaluated considering the detrimental effect an inclusion can have on transmitted light and thus on the brilliance and beauty of the gemstone itself. Type I: Gemstones that are commonly pure, with no inclusions visible to the naked eye. It includes: aquamarine, pink or yellow beryl, green tourmaline, blue zircon and tanzanite. Type II: Gemstones with minor inclusions that do not detract from their beauty. It includes: alexandrite, peridot, garnet, iolite, spinel, quartz, zircon, corundum (excluding ruby) and all the tourmalines (excluding green tourmaline). It includes: emerald, red beryl, ruby. Please note: the detrimental effect of an inclusion is lower in Type III than in Type I. In other words, the inclusions in Type III gemstones are accepted, while inclusions in Type I gemstones reduce their quality. Coloured gemstones clarity grading scale. 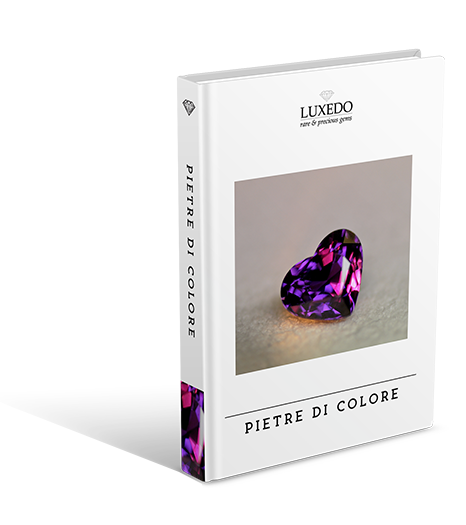 The definition of colour has different parameters and different quality gradings for diamonds and for other fine gemstones. DIAMOND: An alphabetical grading-scale that describes the exact hue of yellow in the gemstone is used for diamond colour grading. The scale goes from D, representing colourless diamonds, to Z, representing yellow diamonds. It is necessary to point out that nature occasionally produces diamonds with yellow, red, blue, brown and even black hues. These are the so-called fancy diamonds. Fluorescence: diamonds when exposed to ultraviolet light can emit a glowing light. This is the typical property of certain materials that emit visible light if exposed to ultraviolet rays. The possible ratings of fluorescence can be: None – Very slight – Slight– Distinct – Strong. COLOURED GEMSTONES: the colour grading for gemstones other than diamonds is expressed by GIA grading scale using terms of comparison and hue, tone and colour saturation description. A further descriptive element is the chromatic balancing and covering of the gemstones. Gemstones can often show many hues within the same crystal. Uncommon colours for a gemstone are called fancy colours. Gemstones cut is defined through the following criteria. SHAPE: round, oval, pear, square etc. The cut quality plays an important role for establishing the value of a gemstone as it can enhance the colour and the brilliance of a gemstone. The best evaluation of these parameters is an indication for a precise cut and greatly affects the brilliance of the gemstone. The overall evaluation parameter for cut is brilliance as it represents the interaction of all the aspects described above. Brilliance is the quantity of light that can be transmitted to the viewer’s eye by a gemstone. The light transmitted by a gemstone is the result of the refraction and internal reflection of the light rays that facets bend and refract back to the crown. An ideal cut allows the total internal reflection and the best light transmission through the crown. The word natural specifies the very origin of the gems, excluding laboratory products or synthetics that are not part of our supply. Then we indicate the geographical area of extraction / import of the gemstone. 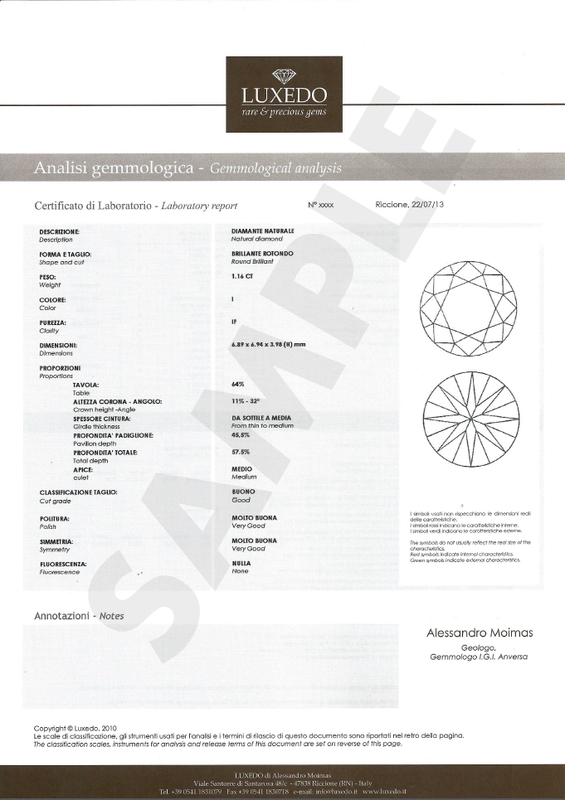 NB: In the gemological certificate the geographical origin can not be shown for lack of specific physical evidences and matches into the gem. The Gemologist analyst normally is not aware of the import area of the gemstone but can trace its geographic origin according to the study of typical inclusions inside the crystal. In case the evidences are sufficient the origin of the gemstone will be indicated in the following way. If the crystal is very pure the evidences may not be sufficient for this type of deductions. 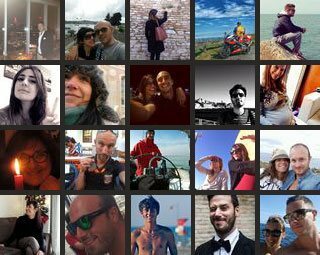 In this field we report any comment of the gemmologist following the gem analysis. We also specify the widespread and commonly accepted treatments as the thermal heating of corundum (rubies, sapphires) or oiling for emeralds.